So we were in Mauritius..on a day tour to Ile Aux Cerfs. 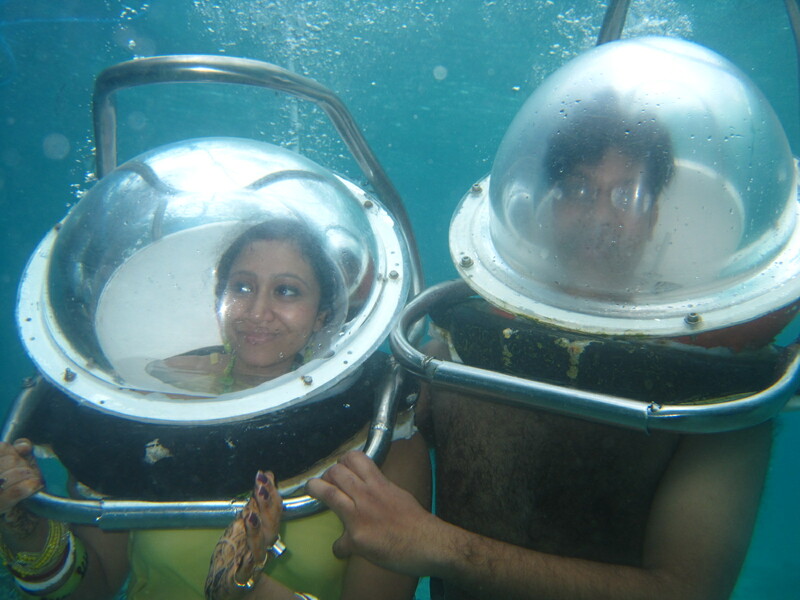 Our first stop was the place from where we could do underwater sea walk. For those who have not done any such thing before, sounds weird and scary, is not?? Well it was for us too!! But since this trip was about trying everything novel, we decided to give it a shot. Not to mention, it was quite expensive, our whole package including all the sports activities cost us around 8000 mauritian rupee ie about 16000 in Indian currency!! We could almost plan a small trip in that price!! Our boat too us to a small dock inside the sea from where we were supposed to descend in the water and walk on the sea bed. Its obvious we would float, so we were made to hang some heavy weights around our body to make us sink. And for oxygen, of course, there was a huge mask that made us look like an astronaut!! I am a bit claustrophobic, and now when I remember the experience, it gives me jitters!! Once the mask was put, the wights hung and instructions carefully explained, we were made to climb down the stairs from the dock to inside the water. We were taught few sign languages like okay or not okay, want to come to the surface, etc. We descended into the water one by one. I gathered every bit of courage I had and put my feet from the last stair to sea bed. Aahh!! I was on the sea bed!! It was silent everywhere, a doom kind of feeling when one dives inside. There were corals everywhere and fish swimming around us!! What a sight!! We were wearing rubber slippers to prevent our feet from getting injured by the dry corals. Our guide led us in a line, touring us through the corals!! He then gave bread in our hands to feed the fish, and they came swarming around!! some of them even bit us!! 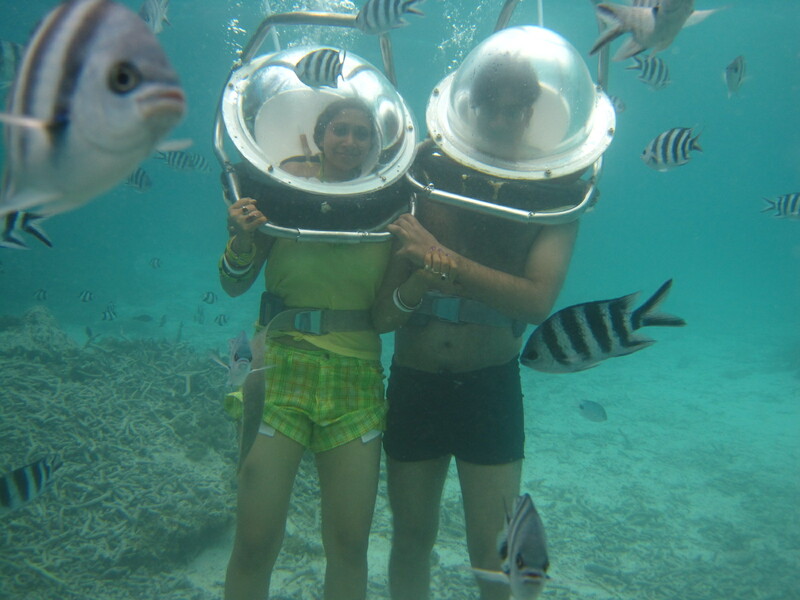 while the fish ate our bread happily, we got our pictures clicked!! We had paid extra for that!! My husband held my hand throughout the walk, and our guide would constantly remove his hand from mine!! He wanted all of us to walk in a straight line in a disciplined manner!! We were then led back to the ladder to get up. The whole tour was just for 10 minutes!! My god so expensive!! But worth every penny!! When we reached the deck, we felt so happy and triumphant!! I would never ever forget these 10 minutes of my life!! wading in water even before I got into the boat!! after we were feeding bread to the fishes, they started coming near us in swarms. the fish on left corner seems to be angry!! he refuses to leave my hand even after our guides scolding!! a small sailor stint before I got into the bus!! I am going to remember this experience forever!! 1.Dont buy the package from your hotel/ tour operator by whom you have booked the entire trip. Buy from the local agents, they are much cheaper. 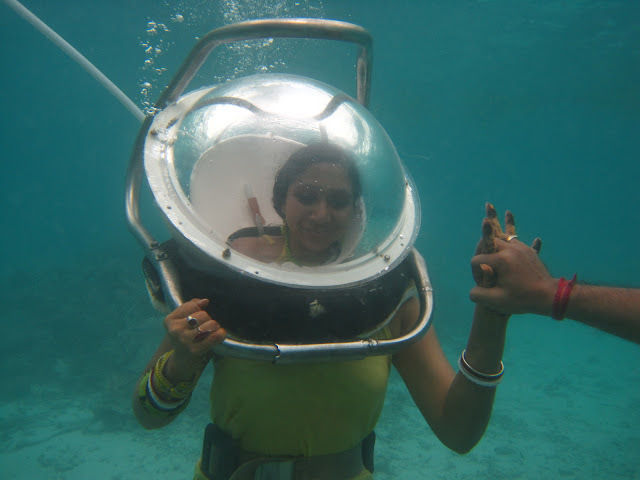 2.This activity is not for claustrophobic people or those who are scared of water. 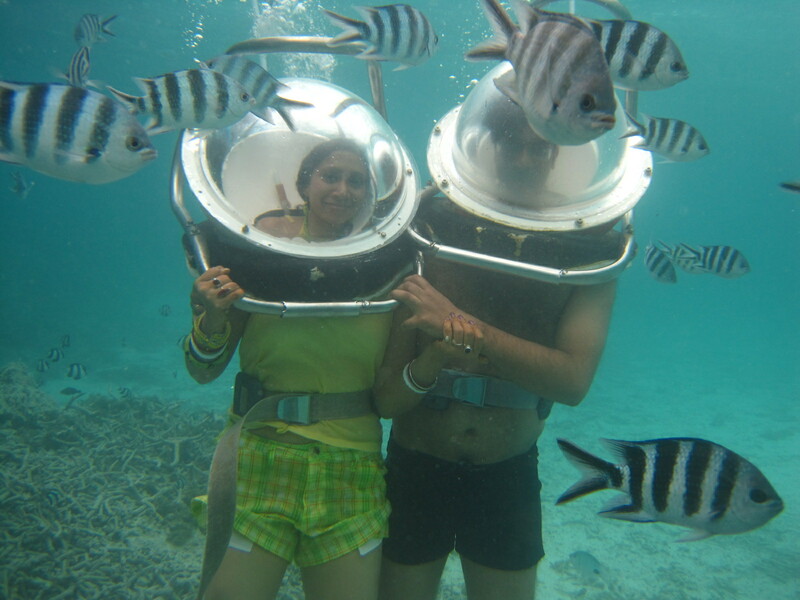 3.Do not forget to buy the underwater photography package. It is going to cost you silly extra bucks but these photos are the ones that are going to stay with you forever!! First time I see this kind of helmets! So beautiful to be surrounded by those fishes. Oh goodness! That looks like such an amazing, once-in-a-lifetime experience! Thank you for sharing all about it. It looks like you're having a fantastic time; I hope your trip keeps getting better and better! :) I'm following you On Bloglovin and GFC now. Thanks for the comment on my blog! Wow a travel blog, that's so cool! Wow....this place is amazing!!!! !Very nice outfit, i love the top!!!! Lovely pictures! I'm glad you had fun! Wow, what a fun trip! I will admit those helmets look a bit intimidating! But what fun! Thanks for stopping by my blog and the lovely comment. Yes, I would love for us to follow each other. Wow what an amazing experience! The color of the water is so beautiful, I'd love to do something like this one day! Thank you so much for stopping by my blog and leaving such a lovely comment! Wow! What an incredible experience! Gorgeous pictures and such pretty water!